Ford officials insist the technology isn't meant to replace traditional tools like clay modeling and computer aided design programs, but rather supplement them. DETROIT -- Ford Motor is hoping to accelerate vehicle design and supplement traditional techniques such as clay modeling with a new-age technology: augmented reality. The automaker is expanding a test of Microsoft's HoloLens mixed reality headsets for use in vehicle design. The wireless headsets -- which can cost up to $5,000 each -- allow designers to place a hologram of a vehicle on top of a real, physical model to quickly see what that vehicle would look like if they changed a headlight shape, raised a side mirror or lowered a hood. If a designer sees a concern or a feature of the vehicle they'd like to change, they can leave voice recorded notes from a specific point of view that another designer can access at a later time. "It's amazing we can combine the old and the new -- clay models and holograms -- in a way that both saves time and allows designers to experiment and iterate quickly to dream up even more stylish, clever vehicles," Jim Holland, Ford's vice president for vehicle component and systems engineering, said in a statement. "Microsoft HoloLens is a powerful tool for designers as we continue to reimagine vehicles and mobility experiences in fast-changing times." Ford officials insist the technology isn't meant to replace traditional tools such as clay modeling and computer aided design programs, but rather supplement them to speed up design decisions and ultimately bring vehicles to market quicker. The automaker says the technology could reduce decision-making times from weeks to hours. 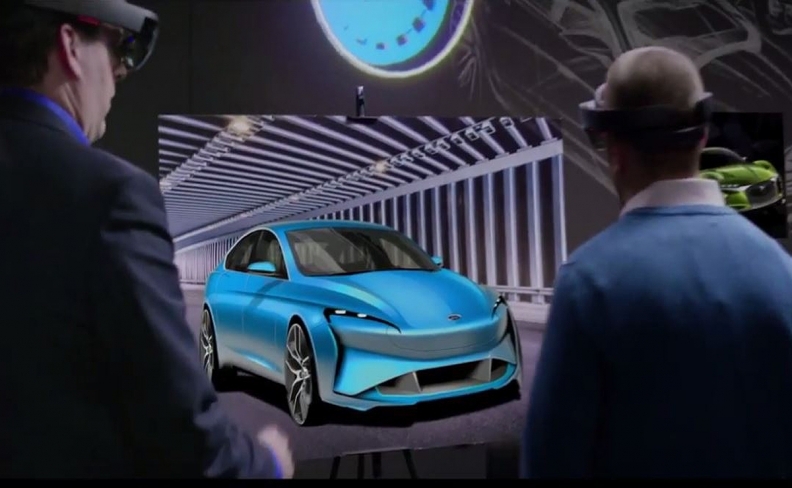 "HoloLens allows a whole team of people to collaborate, share and experience ideas together," Elizabeth Baron, Ford virtual reality and advanced visualization technical specialist, said in a statement. "Mixing virtual and physical models is exciting, because it helps our designers and engineers communicate effectively and ideate to see what the future looks like earlier in the process. This allows great freedom and efficiency in how prototypes are created or changed." The headsets run on Windows 10 technology. As a security measure, users must be individually invited into a design session. Multiple people can view the same virtual 3-D images at once. For example, designers in China could see what changes an engineer in Dearborn, Mich., is making in real time. Microsoft officials first introduced HoloLens in 2016. Since then, a number of companies have used it for commercial purposes, such as Thyssenkrupp for elevator design, NASA for simulating the Martian surface and Case Western Reserve University for teaching anatomy. Ford has been piloting HoloLens for about a year. It now says it will use the device on the design of future production vehicles, but declined to say which vehicle will be the first to use it. Craig Wetzel, Ford's manager of design technical operations, said the company has "only just scratched the surface" of what HoloLens can do. "Possibilities for the future seem almost limitless," he said. "This is very exciting."